Last week, Russian proxies considerably decreased the number of attacks on the Ukrainian troops’ positions. However, militants use the Minsk-proscribed weapons increasingly more often. Over the last week, hostile attacks involving 82-mm and 120-mm mortars were recorded in Avdiivka, Berezove, Hnutove, Hranitne, Zaitseve, Zalizne, Krymske, Luhanske, Mayorsk, Maryinka, Nevelske, Novhorodske, Novohnativka, Novoluhanske, Novoselivka Druha, Opytne, Pavlopil, Pivdenne, Pisky, Svitlodarsk, Travneve, Troitske, Chermalyk, Shakhta Butovka, Shyrokyne and Shumy areas. Moreover, the enemy used 122-mm artillery near Novohnativka, Novoluhanske, Novoselivka, Talakivka, and Chermalyk. Ukrainian troops’ positions outside Bohdanivka, Zoria, Mayorsk, Novotroiske and Stara Mykolayivka came under the fire of hostile 152-mm artillery. Ukraine’s Joint Forces’ positions near Hranitne, Lebedynske, Nevelske, and Pavlopil were attacked with tank cannons. Moreover, there was a series of combat engagements last week: at about 05:00 on May 21, Ukrainian Armed Forces discovered a hostile subversive group of about ten militants on the southern outskirts of Pivdenne village, from which the Joint Forces completely forced the enemy out the week before. Anti-subversive group of the brigade stopped the hostile subversive-reconnaissance group and forced it away from the Ukrainian troops’ positions. Militants incurred losses and retreated to their positions under the covering fire of 120-mm mortars and heavy machine guns. Two Ukrainian troops from the 24th King Danylo mechanized brigade, namely junior sergeant Andriy Maslov (born in 1987) and soldier Viacheslav Kutsmai (born in 1986), were killed in action. What appears to be a tragic coincidence, May 21, the day of the combat engagement, was Andriy Maslov’s birthday. 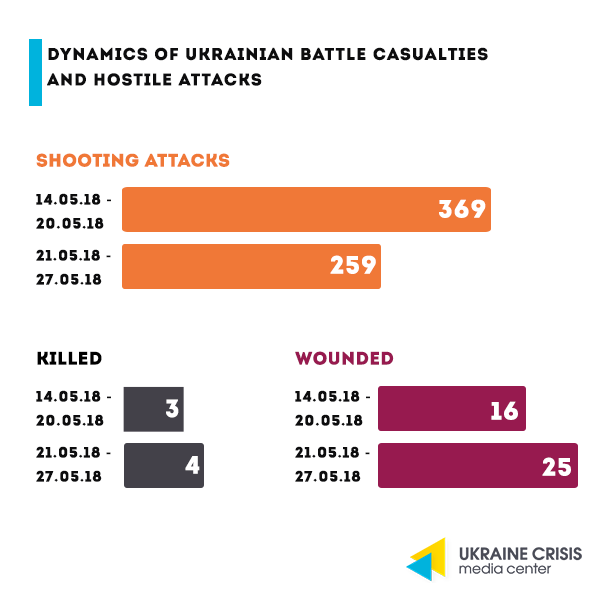 At about 04:00 on May 22, Russia-backed militants attacked Ukrainian troops outside Stanytsia Luhanska using under-barrel grenade launchers, heavy machine guns, and small arms. Militants have been purposefully delivering such provocative attacks for over a month to derail the disengagement of forces planned for the area. At about 19:00 on May 27, Ukraine’s Joint Forces discovered a hostile subversive group in Pavlopil area. In course of a brief engagement, three militants were killed in action and one was wounded in action. At the same time, one Ukrainian serviceman went missing. His whereabouts are being clarified, the search operation is still ongoing. On May 21, Russia-backed militants shelled Toretsk and Zaitseve with artillery and mortars deployed in the occupied Horlivka. The enemy fired six 122-mm and 152-mm artillery rounds and about ten 120-mm mortar rounds at inhabited Toretsk. Russian proxies discharged thirteen 122-mm artillery rounds upon Zaitseve at about 19:30. The shellings resulted in destroyed and damaged civilian houses. At about 19:00, Russia-backed militants started a lasting artillery attack on Ukraine’s Joint Forces positions near Talakivka. Militants fired over ninety 122-mm artillery rounds from the direction of the occupied village Zaichenko. The enemy was purposely targeting the inhabited Talakivka as well. According to the press center of Ukraine’s Joint Forces, some of the artillery shells remained unexploded. Resulting from the attack industrial premises in the village were damaged. Luckily, there were no civilian casualties. At about 04:00, Russia-backed militants shelled two medical facilities, namely mental and anti-tuberculosis hospitals in Toretsk, using152-mm artillery and 120-mm mortars. At least 35 shells hit the abovementioned buildings. Militants delivered the shelling from the direction of the occupied Horlivka using high explosive airburst shell. The walls and windows in the hospitals were damaged as well as the adjacent gas pipeline and several vehicles. Luckily, there were no civilian casualties. At 04:45, Russian proxies shelled southern outskirts of Stara Mykolayivka with seventeen 152-mm artillery rounds. The fire was conducted from the residential blocks of Komsomolskyi district of the occupied Horlivka. One of the shells hit the area of a military ammunition storage where a small part of ammunition was stored. Luckily, there were no civilian casualties. Russia-backed militants hit a three-storied building on Rymskyi-Korsakov street in Toretsk with 122-mm artillery. The shell hit the wall of the building but did not explode. Luckily, none of the residents of the apartment were hurt. The apartment on the second floor and the roof of the building were damaged. The shelling was conducted from the occupied Horlivka yet again.